I determined years ago that establishing a bedtime routine helps me fall asleep more easily, as well as supports me in feeling grateful, happier and more fulfilled throughout the day. And, it’s easier than you might think! Incorporating these five practices into my evening has made a huge difference in every area of my life. By sharing them, my hope is that maybe they will for you, too. In many cultures around the world, people believe the day begins when you go to bed – not in the morning when you wake up. According to them, what you do right before you go to sleep determines the quality of the following day. For example, one day I may decide that I want to focus on being a compassionate person to everyone I come into contact with, including my husband, children and anyone in the service industry. Or perhaps, I choose to concentrate on being the best listener I can be, which means letting people speak instead of being quick to give my own opinions. This question sets the tone for my day, and the answer is the center of focus for the rest of the day’s goals. When it’s time to go to bed, I spend just a few minutes giving thanks that I’ve had this day of life, because I understand that not everyone woke up, nor did everyone live the entire day. There are people who, one day, wake up and plan to live a whole day, but something intervenes, and they’re no longer here with us at the end of the day. Remembering this helps me to appreciate every moment. Next, I remind myself who I decided I wanted to be today, and review the goals that I had set for myself. 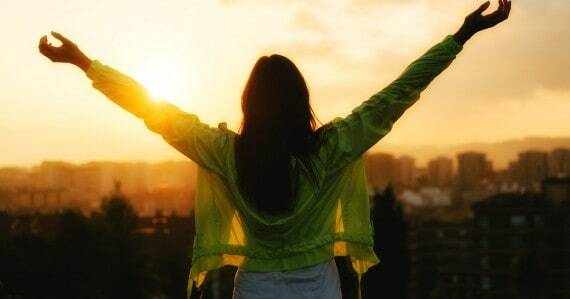 Then, starting with when I woke up, I close my eyes and review everything that happened in my life during that day. I see my day like a movie in my head. I see myself getting up, interacting with my husband and with those I work with. I see myself as I work on any projects, and I pay attention to the state of mind I was in at the grocery store or wherever I went. I notice when I acted and felt like the person I want to be. I also notice the times I became distracted, used a sharp tone of voice or simply wasn’t the person I wished to be. After reviewing my entire day, I use this practice to think about any time during that day that I really wish I had shown up as the person I wanted to be or a time when I wished I had been a better person. In other words, I think about who I wanted to be that day, and when I review my day and notice any times when I wish I would have shown up differently, I “edit out that clip” in my day and lay down new film. For example, one evening I was reviewing my day and remembered a point when I walked out to the mailbox. I was having a great day and I felt happy. 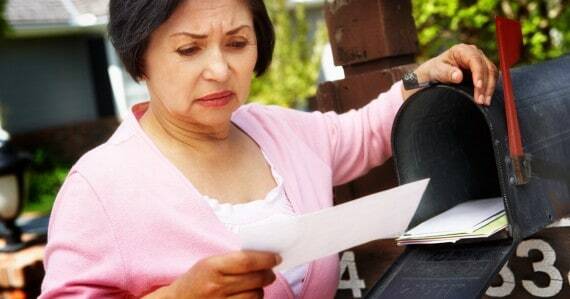 I opened up the mailbox, picked up my mail, and saw a letter from the IRS. My first reaction was to feel worried and fearful because of the information I thought this letter might contain. Now, I want to be a person who knows that there’s a power in me that’s greater than anything, including IRS letters. If I’m going to be scared by an IRS letter, then I’m not being who I said I wanted to be. So, just like a director says, “Cut, and let’s do this scene over again,” I used my imagination to edit this moment in my life. In order to edit out my feelings of worry and fear when I saw the letter from the IRS, I envisioned myself walking out the door, going down to the street and opening up the mailbox. As it turned out, that letter from the IRS actually contained a small refund check, and I realized that I had generated fear that was completely unwarranted! But what’s important to remember is that even if it had been something more difficult, I knew that in any given moment throughout my day, I’m was not alone. I’m never alone. There’s a power with me that’s greater than anything that can come my way. I remind myself that there’s a power in me that’s greater than anything that comes my way. As I drift off to sleep, I know in my heart that I’ll sleep well and, in the morning, I’ll wake up with energy, happy to start a brand new day never lived before, and never to be repeated. Would you love another valuable tool to help you shift into a frequency of gratitude and amplify your abundance? When you feel truly grateful for what’s already in your life, you become a powerful beacon for everything that’s harmonious with your vision of a life you love living..
And to help you shift yourself into a frequency of gratitude, I have a free gift for you! 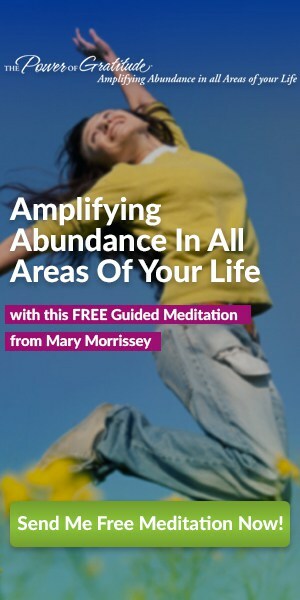 Download your FREE, 10-minute “Grateful: Happy, Healthy & Wealthy” guided audio meditation right here. Love this, Mary! As always, you light the path for others to follow. You have made a huge change in the trajectory of my life over the past few years and I’m so grateful you came into my life. Love you lots!!! Thank you so so much Mary and team for the free meditation.